I find this lovely plant grows in a corner of a public toilet, few people boarded to stop by to appreciate it’s beauty, but it is still happily bloom under the sun. :) Cheers, More flowers are here at today’s flowers. Lovely flower in an unusual place! Very pretty flowers. Does not matter where they are growing, just look at the blooms. Amazing blooms! And in that beautiful colour!!! Beautiful flower with a gorgeous color! Thanks for sharing this lovely photo! They are such delightfully hardy plants that grow and flower in the poorest soil. Love the color! so vivid. 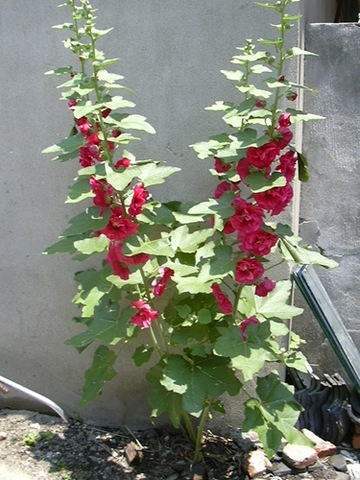 This plant has a similarity with our Hollyhocks in the US. I have not seen this. Thanks for sharing. See how amazing plants survive even on unusual locations. And how they bloom beautifully.